This simple, white high-gloss lacquer square works well with any contemporary design scheme. Generously sized at near 3' square, it provides ample table space for all of your guests, while also accommodating any coffee table books and magazines with display space underneath. 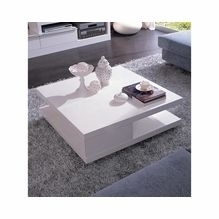 Coffee Table: W35.5" x D35.5" x H12"